Co-curated by Dr. Ron Broglio and Heather Sealy Lineberry in collaboration with the ASU Global Institute of Sustainability and ASU School of Languages and Literatures. 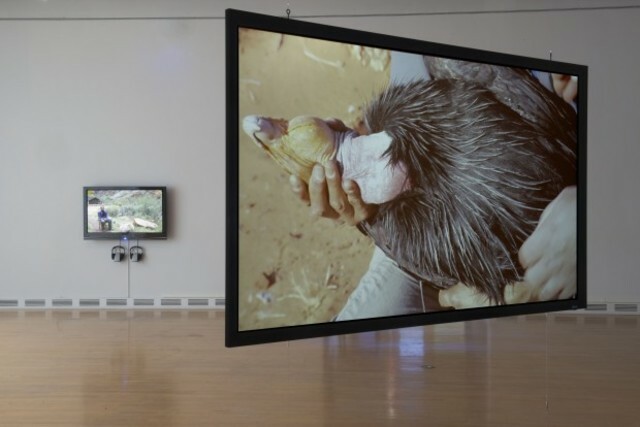 Over a two year period, artists Bryndis Snæbjörnsdóttir (Iceland) and Mark Wilson (England) explored the networks and ripple effects of scientific conservation initiatives in Arizona. In a kind of vertical slice of our natural environment, they focused on the reintroduction of the chub in the Colorado River and the condor in the Grand Canyon. Their exhibition of interactive installations, photographs, videos and objects at the ASU Art Museum conveyed how ecologies can change radically as a result of tiny individual initiatives by human or other agencies. The exhibition explores how we perceive and communicate ideas of sustainability and how effectively we can engender collective responsibility regarding the environment. See associated book (http://insight.cumbria.ac.uk/id/eprint/4246/) and artefact (http://insight.cumbria.ac.uk/id/eprint/4414/).